In the early 1800’s a few Wesleyan Methodists began meeting in a home. When the group grew they rented a room above a shop before securing a plot of land on Skipton Road, on which to build their first chapel. This opened in 1834. Within 30 years this building was too small and the foundation stone for a larger chapel, on Wells Road, was laid in August 1868. Meanwhile, the Primitive Methodists had been established in home groups during the 1850’s. Their Leeds Road Chapel was opened in March 1878. It was influential friends of the denomination throughout the West Riding who judged that Ilkley should have a Congregational Church. Thanks to their generosity a prime site was secured on The Grove and the foundation stone was laid in May 1868. 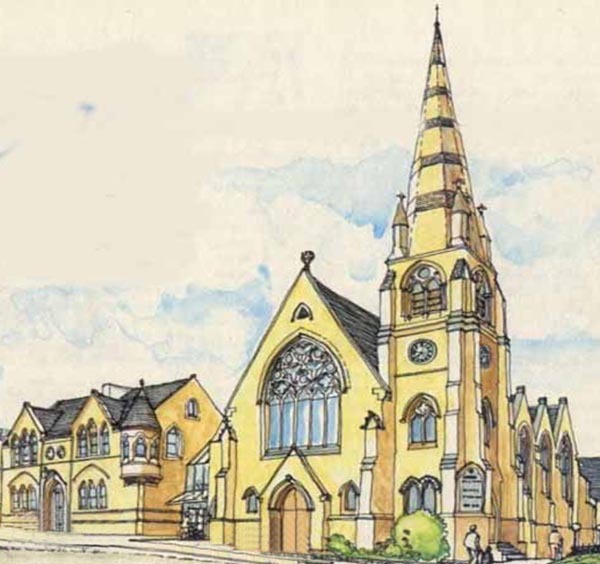 Leaders of The Grove Congregational Church resolved to build a Mission Hall for residents in Leeds Road. This was opened in 1902. Seventy years later the Mission Hall closed and members were invited to join the congregation at The Grove. Around the same time members of Leeds Road and Wells Road Methodists united to form Ilkley Methodist Church, at the Wells Road site. Conversations about the possible union of the Wells Road Methodists and The Grove Congregationalists of Ilkley began in the 1960’s. The amalgamations referred to above meant this prospect was put ‘on hold’ for a number of years. However, in 1981 the congregations of Ilkley Methodist Church and The Grove (by now part of the United Reformed Church which came into being in 1972) merged to form Ilkley Christchurch Methodist / United Reformed Church. The church held its first service on the first Sunday in Advent, 1981. For a comprehensive description of the evolution of Christchurch see the excellent "Roots and Branches" book, copies of which (£5 each) are available from the Coffee Centre or the Church Office. You can order one by post by writing to the Church Office enclosing a cheque for £5. The address is Christchurch Office Secretary, The Grove, Ilkley, West Yorkshire, LS29 9LW. Brian and I heard of Christchurch long before we came to live here, in the summer of 2004. Indeed, when people ask ‘What made you choose Ilkley?’ we have to say that Christchurch was one of the principal attractions. Before beginning our search for a home, when we were still wondering if this would be the right place for our retirement, we attended worship on a number of occasions. The warmth of welcome and sense of ‘something special’, convinced us that this should be the place. How glad we are to belong, to live in this glorious place, coming home to the hills of West Yorkshire, for we grew up in this area, and spent the first ten years of our marriage in Keighley. We delight in the local countryside, in the vibrant community of Ilkley, with its festivals, theatre and shops. There are many occasions when we acknowledge how fortunate we are to live here. Most of all we are thankful to belong to Christchurch. What makes it so special? The answer is complex. For me, it is special because I sense that the members of the congregation treasure one another. It is not only that the sick are visited and elderly infirm members cared for, though they are. Nor is it because all age groups are welcomed and a variety of theological opinions are accepted, though that is true. It is not even because the various acts of worship are vibrant and meaningful to those who gather. I sense that there is something deeper, and in an effort to understand what that might be, I asked questions about the past, seeking to discover more of the history and traditions which lie behind the Christchurch of today. As individuals we are shaped by the genetic imprint we inherit from our parents. The same is surely true of our Christian heritage. I discovered that the roots of Christchurch lie in various traditions and denominations. I wondered whether anyone had thought of writing a history and before long I was commissioned to compile one! As I sifted through the many documents and papers which were passed on to me I came across the report of the ecumenical group which undertook an evaluation in 1991, ten years after Christchurch was born. They had many complimentary comments to make, but amongst the concerns expressed was the lack of awareness of members of the rich traditions of faith of the parent denominations. Their recommendation was ‘that someone is commissioned to write the story of Christchurch’. Here it is, fifteen years later! It might have taken longer to produce but there was a deadline as this book is part of the celebration of the Silver Jubilee of Christchurch, marking 25 years since the Ecumenical Partnership commenced. An author of a book about John Wesley, by the name of Charles Edwin Schofield, wrote, seventy years ago: ‘An Anniversary may prove an opportunity. It is always in danger of becoming a serious liability . . . the trouble is that we are so prone to romance about the past.’ Our backward look is sometimes through those ‘rose tinted spectacles’ which distort and soften the memories. It is my privilege to record the history of Christchurch, setting it within the history of our Methodist and Congregationalist (now United Reformed Church) parent denominations. I hope the story will help readers to capture something of the spirit of those who laid the foundations of our faith community. If a note of nostalgia and a romantic view of the past creeps in, forgive me!